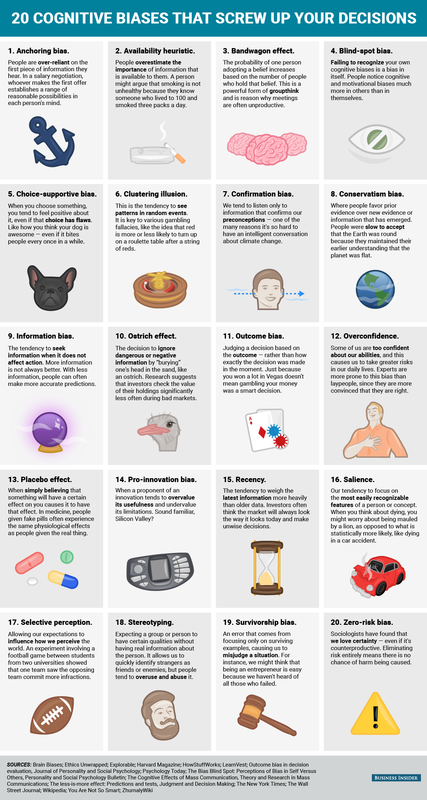 Cognitive biases are everywhere and affect our daily lives in a huge way. They affect the way we think, the way we act, and the way we interpret information. A cognitive bias is essentially when our brain slips up and uses some illogical reason to come to (sometimes harmful) conclusions. These slip-ups are so common and so predictable that we can actually quantify, categorize, and test for them. Today, I wanted to talk about a few cognitive biases that can specifically relate to the workplace, and describe how we might be able to get around them to produce better results and happier people. I put this one at the top because I believe it's the one that we're most guilty of in the games industry. Survivorship bias is looking at the successes without acknowledging the failures, and it comes from the fact that most of the people we see are the ones who have succeeded. The companies that failed, well, they aren't around to tell you about how they failed. This is clear in the games industry when we go to conferences, listen to speakers, meet people at networking events, and so on. The people that we meet are the ones who were at least successful enough to be at the event, and that's already a big step up on the majority of start-up studios. There has been a recent trend toward listening to people's failures, which I think is a great thing. People are becoming more open about their failures, and we're seeing things like "failure workshops" at the Game Developer Conference which is a series of talks about what went wrong and why. My first tip to avoid survivorship bias is to start small and dig deep. It's harder to find stories about failures because people are ashamed about it or these stories aren't visible on the platforms you're looking at. So start small, by looking at slight failures. In the case of games, this might be a game that appeared to have great hype but only sold 2,000 copies. Why didn't it sell well? What went wrong? This should be easy enough to find by looking at public-facing information: trailers, reviews, etc. Then, try to go a little deeper. Find some games that look like they might have had a chance, but have no reviews and no public statistics. Sometimes, you might have to reach out to developers directly and ask them what went wrong, and usually (in our industry at least) they'll be happy to tell you. For an interesting resource about failure, autopsy.io has a list of failed startups and the reasons why they failed. The second tip is to strip it down to its core. If you see something that worked, don't focus on small details or hang on to gimmicks; the game didn't sell because the main character had a hat, the game sold because the main character was relatable and their motivation was easily understood. This still falls into the trap of looking at successes, but it's both less likely to lead you down a false path and more likely to allow for pattern recognition if you can strip it down to the basic building blocks of the success. Replace "the art style was pixel art with watercolour painted backgrounds" with "the game had a distinct, captivating art style". "You can't teach an old dog new tricks." I've heard this a lot about companies; "stick to what you know, make small incremental improvements", etc. Conservatism bias is rejecting new information and not being willing to venture into the new because the old way seems to work just fine. I'd argue that this approach doesn't work in any industry. I'd say toilet paper is probably one of the most basic products I can think of, where it hasn't changed in years. But if you want to be competitive in the toilet paper industry, I would guess that you still can't be afraid to push the technology, push the manufacturing techniques, or push the boundaries of marketing efforts. In the games industry this is especially true. The technology is changing so quickly and the market is changing so quickly that we have to adapt with the times. Not only do we have to adapt in terms of the games we make, but we also have to adapt in terms of the way we manage our people, manage our workspace, and manage our lives. There are two suggestions I have to help with this bias. The first is to keep your eyes and ears open. Don't say no to ideas flat out, and listen to what other people are saying. The second suggestion would be to respect your peers. Your colleagues, partners, employees, and contacts often have more experience and knowledge in certain fields than you do. To step outside of the box, sometimes you need to trust in others. This is the complete flipside of the previous point. Pro-innovation bias involves being overly excited about new technology or innovation without thinking logically about potential outcomes. A good (made up) example could be trying to make a game with photo-real 3D graphics for mobile using new technology that requires 8x more RAM than other games. While the technology might be cool, our phones aren't ready for that kind of thing, and the idea might fall flat on its face... if it has a face. This isn't to say to avoid innovation... not at all. The key is thinking realistically and logically about the limitations and the potential of the new innovation and deciding whether or not it's a path you want to go down. The most important thing to do to avoid this bias is to do your research. Is the market ready? Is the technology there? Is there a demand? Can you create a demand? A cool idea is cool, but that's not necessarily a good enough reason to commit significant time and money to it. Survivorship bias and outcome bias can be closely linked in the field of video games. We often judge our decisions based on the outcome of the situation, even if it wasn't necessarily the right decision. That's the core of outcome bias, and it can be dangerous, especially when the sample size of your "experiments" are so small. For example, if you make a decision pertaining to one game and it works, you might be likely to think that that was the right decision simply because it worked. Another company may make exactly the same decision, and it doesn't work out for them. In fact, even your own choice that works once (yes, we definitely need a live-recorded trailer because we had one last game!) won't necessarily work the second time around... you're probably missing a piece of the puzzle. I think that one way that we can try to avoid the bias is, as I said previously, do your research. If you can find cases where the same decision led to failure, while in your case that decision led to success, there's probably another factor at work. Another important way to avoid this bias is to argue your decisions based on facts or logic. I mean, the whole point of avoiding these biases is that you make your decisions based on logic, but if you can defend your original decision based on logic and not based on evidence, you have a much stronger argument. That way, when you make the decision again, you won't succumb to this bias. An interesting little experiment to try involves going through a day questioning your own decisions and actions, and really trying to take a 3rd person observer seat of yourself to see what kind of biases affect your decisions. Everyone does it, but being aware of it will likely lead you to more logical decisions in the future. I hope this article helped in some way to open your eyes a bit to things to watch out for when in a leadership role, be it in game development or in any other field.